A very cool climber that can give any location the exotic jungle look, Epipremnum pinnatum starts out with small arrow shapes leaves that morph into pinnate leaves (similar to a palm frond) as the plant climbs and matures. Ultimately the leaves can get as big as 3 feet long! Cold hardy, and easy to grow- Epipremnum pinnatum is native to the Phillipines, and is neither a Monstera nor a Philodendron. 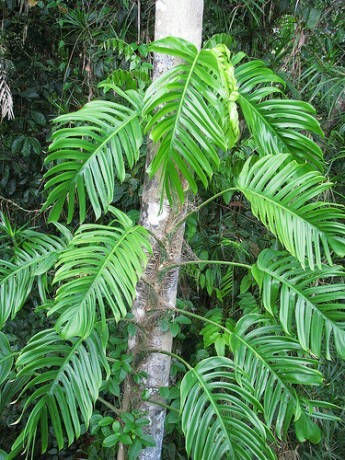 It will easily climb along fences, walls and especially the trunks of palms and trees. It is easy to maintain, just cut it back if it gets too large or climbs too far. 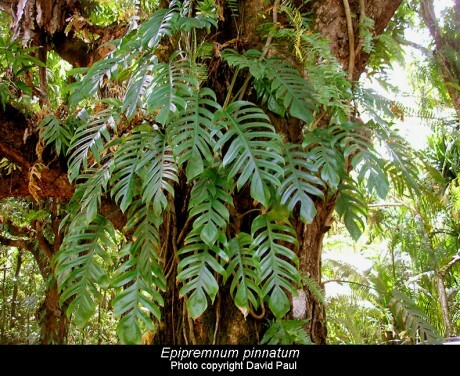 I use Epipremnum pinnatum to cover the waterfall next to my pool, and also to climb up tree and palm trunks in the garden. The pinnate leaves give the perfect tropical look.. filling your garden out with this one really adds the true exotic touch. Epipremnum pinnatum can also be grown as an indoor houseplant where it can climb up a totem or wall.